HPLC Accessories, tubing, couplings, fittings, sample loops, etc. 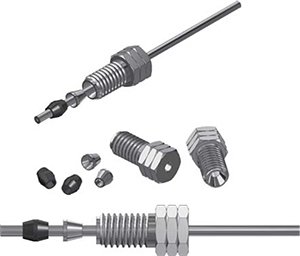 Our Tri-Fitt fittings for very high pressure UHPLC and HPLC applications that require no leaks at pressures at or above 1400 Bar (20000psi). 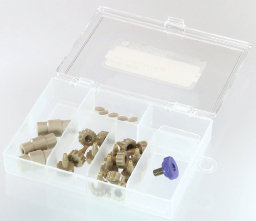 The fittings kit is designed with three separate parts that include a Carbon-PEEK ferrule, a stainless steel triangular ferrule and a stainless steel nut. The Carbon PEEK ferrule deforms when the stainless steel nut is tightened and the stainless steel triangular ferrule clamps onto the tubing at the same time to increase the sealing pressure. The fitting can be reused throughout the flow path without losing tightness. Both stainless steel parts are reusable. When tightening the nut the tube turning is very much reduced. Each kit contains all three parts, is moderately priced and comes in packages of 10 complete kits. For 1/16 inch OD tubing, 10-32UNF. Go to the webshop page of our high pressure UHPLC fitting.